Question: Why Do I Fall Asleep When I Meditate? Answer: You probably fall asleep during meditation because you are sleepy. 🙂 Meditation can be so relaxing that if you are the least bit tired you may doze off. The first remedy is to make sure you are getting enough sleep. In order to stay alert during meditation try the following. Choose a straight back chair to sit in. While sitting in the chair, don’t allow your back to rest against the back of the chair. To do this just scoot up several inches. Now when you meditate, if you begin to fall asleep, your body will adjust to keep your balance. 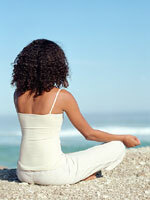 In addition, try to do your meditation or quiet time in the morning as opposed to the evening or close to bed time.